Are you a collector of Original Comic Art, an aspiring collector looking to learn more about the hobby, or simply a fan of good Comic Artwork who wants to see some great pictures? How many times you forgot to bid on that Jim Lee Batman page or that Romita Spiderman you were looking for? Did you discover too late that your favorite John Byrne X-Men Original Art was for sale last month? 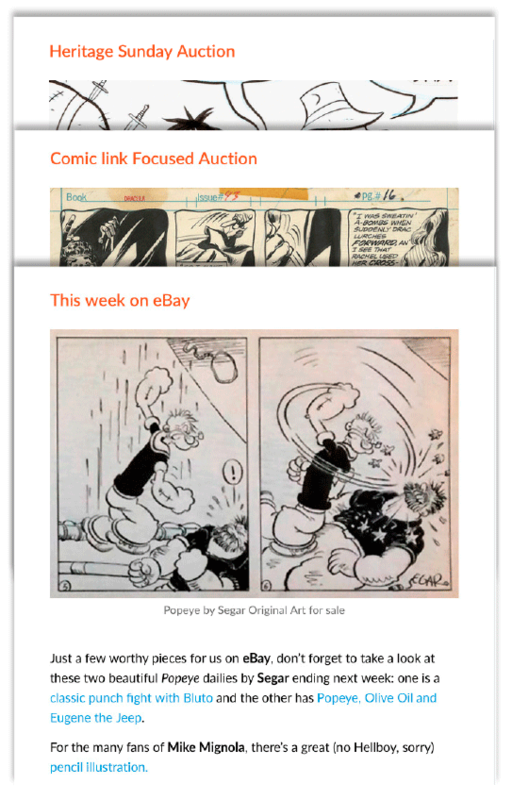 Do you want to be informed about Auctions and Comic Art for sale in every genre (classic and modern Superheroes, Comic Strips, Disney Original Art, Alternative comics…) and in every country of the world (Italy, France, Spain…)? Subscribe to the Comic Art Tips Newsletter to get the answers to these questions and to know everything that is happening in the Original Comic Art world every week. 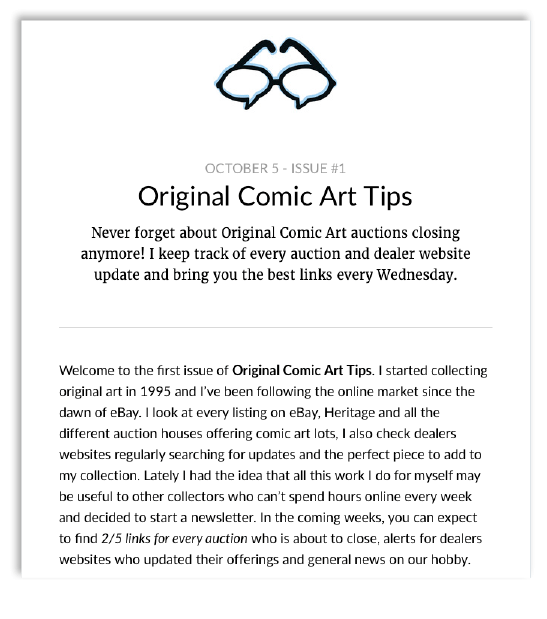 Each weekly Original Comic Art Tips Newsletter begins with news about the original art market: new auction announcements, exhibitions, books and record sales. Every week I look at every Comic Art Auction listing and bring you a summary with links to the best lots that are about to close. 2/5 links to Great Original Art Categorized by Auction house: eBay, Heritage, Comic Link and more, A mixed selection made to appeal to every taste and every pocket and to fans of Comic Art produced and sold in every country in the world. Want to see more before subscribing to the Best Original Art Newsletter? Click here to read all issues of Original Comic Art Tips on your browser.